With an increase in the number of flights between major Japanese cities and Okinawa operated by low-cost airlines and the introduction of new international routes, including Seoul-Okinawa (Jin Air) and Taipei-Okinawa (Peach Aviation), visiting the fascinating island of Okinawa has become easier and cheaper than ever before. 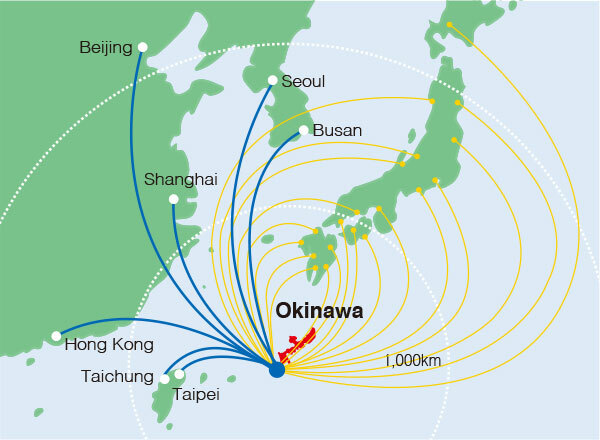 Check out the most time and cost-efficient way to access Okinawa from your home! *Flight information above is as of September 2013 and subject to change without notice. Check with airlines to confirm. Airplanes shuttle multiple times daily between Naha Airport and the mainland's major airports, including Tokyo (Haneda, Narita), Osaka (Itami, Kansai), Shizuoka (Fujisan Shizuoka), Ishikawa (Komatsu), Kobe, Nagoya (Centrair) and Fukuoka. The number of flights offered by each airline varies by season: generally more flights are available during the summer months. Transportation from the main island of Okinawa to remote islands is by either airplane or ferry. There are also direct flights connecting the mainland cities and Ishigaki or Miyako. Island hopping tours are highly recommended for those looking to enjoy not only the top sightseeing spots on the main island of Okinawa, but also the outer islands, each unique with their own attractions. If your focus is on visiting the Yaeyama Islands, choose Ishigaki Island as a base for your island hopping, as it's the central hub for the inter-island transportation within the area. With some of the country's major low cost airlines, including Jetstar and Peach Aviation, having introduced new routes connecting Okinawan islands and mainland airports in 2012, it has become much easier and more affordable than ever before to visit Okinawa and its fascinating outlying islands. The increase in the number of flights to Ishigaki Island following the opening of New Ishigaki Airport is contributing to the growing popularity of island hopping tours in the Yaeyamas. In addition, Japan's major airlines have also recently started offering tickets for the outer islands, such as Ishigaki and Miyako, at more discounted prices to beat the low cost carriers. *Flight times may vary depending on air currents. *The cost of calls must be paid by the user unless otherwise stated. *Flight and airline information above is as of September 2013 and subject to change without notice. Check with airlines to confirm. With the exception of the monorail, which runs only within Naha City, cars and buses are the primary methods of transportation on Okinawa. However, many bus services, including route maps, are not available in English. The operation of local buses may be complicated for first-time users who are not acquainted with the system or the locale. It is not a practical option for those who have a limited amount of time for traveling on the island. Many tourists take taxis or rent a car to get around on their own. With no rail or underground service available, cars, buses, taxis and vehicle charter services are the primary ways of getting around Okinawa. Yui Rail, a monorail system running across Naha City, is a convenient means of transportation when you are traveling within Naha's downtown area.Bus fares vary depending on the routes, company and category of bus taken. On ordinary local buses, passengers must pay exact fare in yen cash (bill and coin changers are available on board). In some places, the bus stop of the city line is positioned away from that of the suburban line. Keep in mind that although they are posted at bus stops, arrival times are not always dependable since they tend to fluctuate due to traffic. Make sure that you are getting on the right bus, especially on Kokusai Street, where numerous buses operate. In order to avoid the possibility that the driver will fail to see you at the stop, signal your presence by raising your hand. 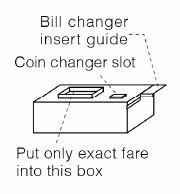 Put only the exactamount of fare into the fare box. Bills (1,000 yen bills only)should be changed by using the bill changer. 500 yen, 100 yen and 50yen coins can be changed with the coin changer. On city route buses and some suburban lines, however, you will automatically receive the change. 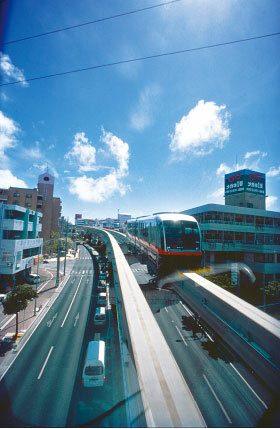 The best way to get around Naha City is to take the monorail. Traffic gets heavier during the summer tourism season, and parking is very expensive. It takes 60 or more minutes to get to Shuri from Naha Airport by road due to heavy traffic; however, the monorail runs 12.9 kilometers (about 8 miles) in 27 minutes from Naha Airport to Shuri, allowing you to shorten a bus or taxi ride by between 15 and 42 minutes. New shopping malls and shops were built around each station after the monorail started operation. Spots like the new Okinawa Prefectural Museum, which opened in November 2007, T Galleria Okinawa by DFS and large shopping centers are located around Omoromachi Station in the Shintoshin area. Yui Rail runs 20 meters (about 66 feet) above the ground, so you may have a chance to see the Kerama Islands on a clear day. The Shuri district is 1,000 meters (0.621 miles) above sea level, affording a view of Urasoe City, which is located next to Naha City. Watch out for bus lanes! Beware of empty lanes in a traffic jam. Okinawa is a society largely dependent on private vehicles as a primary means of transportation. This fact makes major roads on the island heavily congested during the morning and evening rush hour on weekdays. To ease the traffic congestion, some lanes are restricted to buses, to the exclusion of most other vehicles; however, in addition to buses, taxis, motorcycles and specially exempted vehicles are allowed in bus lanes. Police officers make random checks and issue tickets carrying fines between 6,000 yen and 7,000 yen to motorists violating bus lane rules. The Okinawa Expressway is a toll road that runs for 57.3 kilometers between Nago in the north and Naha in the south. While it takes about two hours by car to travel between those cities on Highway 58, it’s approximately one hour using the expressway. Motorists on the expressway should be careful to observe the 80 km/h speed limit at all times. 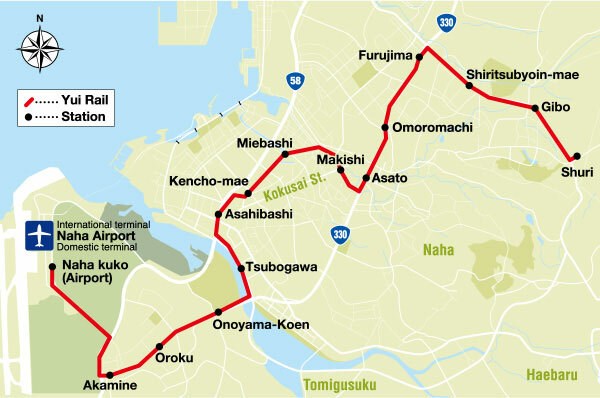 The Naha Airport Road (toll free) runs from the Nishihara I.C. near the U.S. Consulate General in Urasoe City to the Nakachi I.C., approximately 10 minutes from Naha Airport. In addition, the entrance at the Yaka I.C. allows you to travel in the direction of Naha only, while the entrance at the Kishaba I.C. is restricted to minicars and ordinary vehicles registered in the electric toll collection (ETC) system and again allows travel only in the direction of Naha, open between 6:00-22:00. To pay the toll, give the ticket to the attendant when exiting the expressway and pay the fee shown on the screen to the right of your car. To utilize the ETC, you have to install a special device on your vehicle, purchased at car accessory shops, and register in the system. Rental car charges are relatively inexpensive in Okinawa as in the rest of Japan due to competition between rival companies. Average daily rates start from 2,000 yen for a light vehicle (with a 550 cc engine or less), 2,500 yen for a small 1,000 cc van and 5,000 yen for a van that has a seating capacity of six people or more. However, not all rental car companies provide assistance in foreign languages, so it is best to choose one that caters to foreign visitors. Most car rental companies are situated in the vicinity of Naha Airport and at T Galleria Okinawa by DFS in Shintoshin, with some having branch offices in the resort hotel towns of Chatan and Onna Village, where you can pick up and drop off a rental car. Some car rental companies are starting to install multilingual navigation systems in Korean, Japanese, English and Chinese. Car rental companies offer free pick-up from and drop-off at the airport, but a popular route is to go by monorail directly from the airport and get off at Omoromachi Station (approx. 19 minutes) and rent a car at the adjoining Rent-a-Car Depot (in T Galleria Okinawa by DFS). Be sure to confirm what is included in the cost before arrival because the full price can become quite expensive after the insurance premiums are added, even if the basic rate is low. Furthermore, making a reservation beforehand is strongly recommended, especially for a trip during busy periods such Japanese holidays, Golden Week (end of April to beginning of May), during Obon (mid-August) and in autumn. Look at various plans because it is occasionally cheaper with a hotel or a rental car package through a travel agency. For renting a car, the presentation of an international driving permit or a driver’s license issued in Switzerland, Germany, France, Belgium, Slovenia, Monaco or Taiwan accompanied by a translation from the relevant embassy or consulate in Japan or the Japan Automobile Federation (JAF) is required.